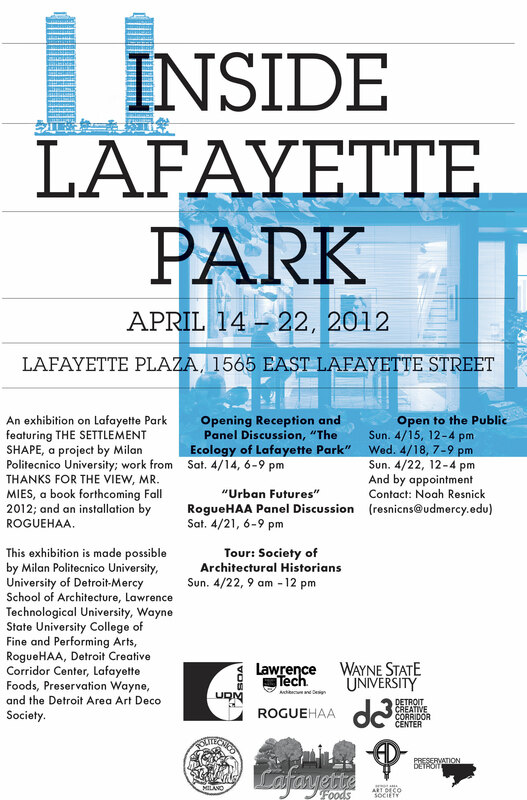 rogueHAA is pleased to announce the collaborative event, “INSIDE LAFAYETTE PARK”. This multi-event design celebration will occur between April 14-22nd and is co-curated by The University of Detroit Mercy School of Architecture (UDMSOA), Lawrence Technological University (LTU), and Wayne State University, and in conjunction with rogueHAA, Preservation Detroit, The Art Deco Society, and the Detroit Creative Corridor Center. “The Settlement Shape” as authored by The school of architecture at the Milan Polytechnic. 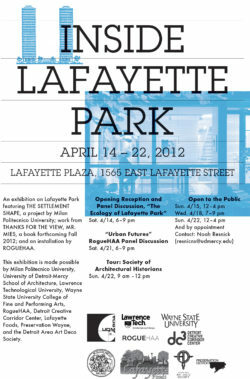 This traveling exhibition showcases the culmination of ten years of research and documentation on Detroit’s Lafayette Park. This exhibition utilizes models, drawings and photographs to trace the history and theories of Ludwig Mies van der Rohe’s, Ludwig Hilbersheimer’s, and Alfred Caldwell’s visionary design. Having spent the last year touring some of the major universities in Europe, this exhibition is now making its debut in Detroit. “Thanks For the View Mr Mies” as authored by Danielle Aubert, Lana Carver, and Natasha Chandani. This portion of the exhibition includes content, photos, and ephemera resulting from their soon-to-be-published book looking inside the lives of the Lafayette Park residents. 30 Corine Vermeulen photographs are included in this portion of the exhibit. “Black Bottom” as authored by rogueHAA and showcases the historical significance of the Black Bottom area prior to the Mies’ urban renewal project. As always, all rogueHAA events are free and open to the public.